Anyone who knows me knows I’m a bit persnickety about my kitchen. I like everything to be immaculately clean and orderly – counter tops shining and everything put away. No toaster or blender or mixer out on the counter. I like as much space as possible to make a real mess on when I’m cooking. So, tuberculosis it’s an absolute wonder that I’ve kept my new Ad Hoc at Home cookbook on the counter for the past month. It’s just so beautiful and inspiring and I like to peruse it while I’m wondering what to make for dinner. One of the recipes that kept catching my eye was a Fig & Balsamic Jam that sounded like the perfect accompaniment to a large hunk of Manchego taking up room in the cheese drawer (Yes, I keep an entire drawer of cheese… Don’t judge me.). Of course, it’s winter and fresh figs are still a few months away. But I wanted some fig jam now! So, I tweaked the recipe to see if it would work with dried figs. And happy surprise – it did! This jam is super quick and endlessly delicious. Paired with cheese, it’s just dreamy. Brings a little bit of summer to your plate. I highly recommend you make it as soon as possible. Place the figs, sugar, balsamic and water in a medium-sized sauce pan over medium heat. Once it comes to a bubbling simmer, reduce the heat to low, cover and cook for 20 minutes, or until the figs have absorbed most of the cooking liquid. Remove from heat and carefully use a blender or food processor to puree the jam, breaking up any large pieces of dried figs. Stir in the lemon juice and let cool completely to room temperature. Store in an airtight container in the fridge for up to 1 month. We actually were invited to an Ad Hoc dinner party the other night……the host made everything from Keller’s lunatic book….the garlic confit, the wine soaked raisins, the rub, the oven dried tomatoes, etc. A lot of work, though a very good meal. (he makes Suzanne Goin look easy). Fig jam is my favorite, and the ad hoc recipe is right on the money. what a fun sandwich! after your ringing endorsements, I really must get this book. i made a fig balsamic jam a couple times this winter to eat with cheese, and here i thought it was an original idea! i should have known. thomas keller already PUBLISHED it. mine is more savory, skipping the sugar and lemon, adding black pepper and sea salt. this makes me want the book even more. thanks for sharing. I would hoard this in my frig and use it when I want something special,like your sandwich! I’ve been eyeing this recipe from ad hoc for awhile now. I’ll have to bump it up on my “to-make” list after seeing you pull it off with such finesse! 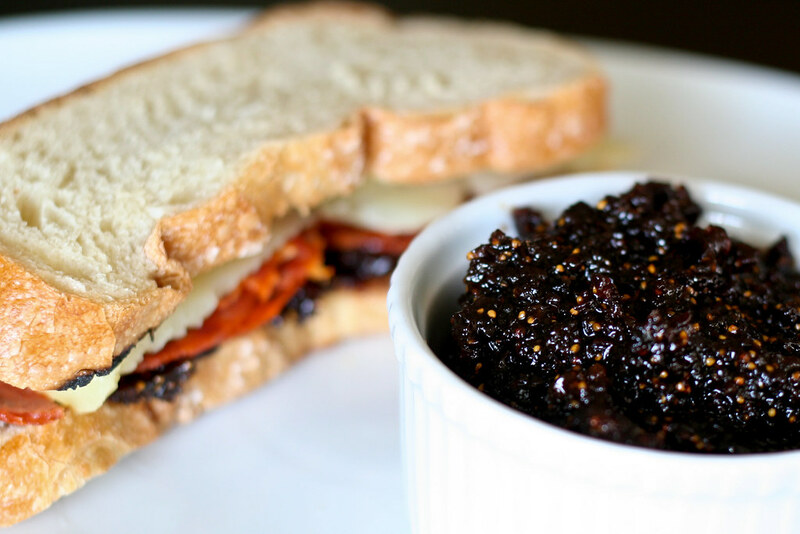 I LOVE fig jam but never have had it with balsamic before, something I must try! An entire drawer of cheese is totally normal. You can never have too much cheese. That combination of flavors in a sandwich is just the kind of lunch I’d like to eat everyday. Finally the secret is revealed! all these years! when they opened that briefcase in “pulp fiction” that”s what John Travolta was looking at? the Fig Sangwich !? Very nice recipe next time I have friends over going to make mini versions of these. Oh my, that jam AND sandwich definitely look good! This jam has me absolutely swooning. Figs are definitely one of my favorite fruits…my dad has a tree in our backyard and I hoarded them this summer. Much to his annoyance. And chagrin. However, I’ve been pining for them now that they’re out of season. This jam sounds like a fantastic solution this dilemma! I love fig jam. Sometimes, when I’m using dried figs for the jam, I add some dried apricots, too. It’s wonderful atop goat cheese on crostini. And, I’m pretty sure I need to buy a copy of Ad Hoc. Oh heck yeah, that’s the best jam there is! Swoooon! Beautiful site, I’m new here! Congrats on the Saveur nomination!